This is the treasure from many generations in the Mediterranean, a product from a fruit born in the sun of a dry land. The Tabernas desert region may be better known for the spaghetti western film productions of Sergio Leone, or more recent productions, like Game of Thrones. Perhaps the region’s fame derives from the massive installation of greenhouses, so large it can be seen from space, that yield 50% of the fruit and vegetables grown yearly in the EU. And it is here, in the heart of Europe's driest area, that lies a secret treasure: Oro del Desierto's olive groves, which thrive in this microclimate of minimal rainfall and over 3,000 hours of sunshine. The four olive varieties grown on the estate represent the true taste of Spain: the light and fruity Arbequina; the smooth and mildly sweet Lechín; the medium-intense family favorite, Hojiblanca; and the robust and famously high phenolic Picual. While each monocultivar oil deserves and wins awards in its own right, the specially-crafted and multi-award winning Coupage represents the culmination of all the careful work performed at the farm. With the desert conditions testing the trees each year, they also test the Master Miller who is tasked with creating this perfect varietal blend year after year. The climate influences not only the identity of the trees’ caretakers, but also the identity of the olives grown on the estate. As a result, the desert trees create oils with more intense flavors and levels of polyphenols. The unwavering heat also aids the health of the trees, while stable temperatures throughout the whole growing and ripening period lead to a remarkably consistent product. It is this consistency, alongside the family tradition of organic farming, that produces these exceptional and treasured oils. This organic oil from 100% Picual variety olives is a medium-intense fruity oil with well-rounded fruity aroma and robust taste with vegetal notes and almond finish. An award-winning oil blended by the Master Taster to create a taste that is well-balanced and medium to smooth in intensity with a pleasant, slightly spicy aftertaste. From 100% Arbequina olives this is a medium fruity oil known for its complex vegetal aroma with hints of ripe tropical fruits, banana, parsley and basil. From 100% Hojiblanca olives this is a medium-robust intense fruity oil, strong with elegant fruity notes and a robust and spicy taste with well-balanced bitterness and pungency. This attractive gift set includes three organic single-variety olive oils from Oro del Desierto: Arbquina, Hojiblanca, and Picual. 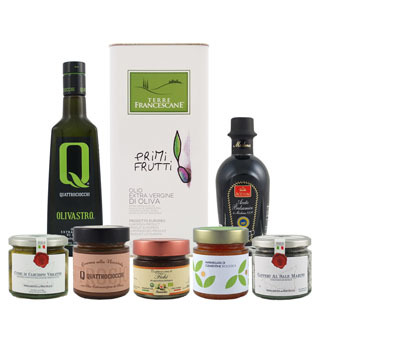 This attractive gift set includes four bottles of organic single-variety olive oils - Arbquina, Hojiblanca, Lechín, and Picual - and one bottle of the award-winning “Coupage” blend from Oro del Desierto. From 100% organic Lechin olives, this medium-light fruity oil is known for its complex aroma, with a well-balanced flavor and a delicate spicy finish. Having achieved success in various businesses involving restaurant and farm properties, Rafael Alonso Aguilera, the family patriarch, returned to his organic farming roots on a full-time basis in 1999 after inheriting the family estate. 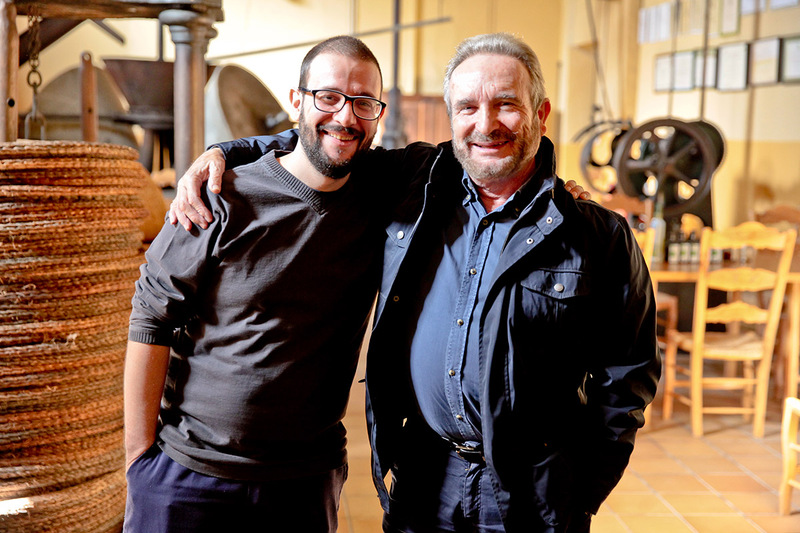 The family already had part ownership of an old mill built in the 1920s that belonged to José Alonso, Rafael Alonso’s grandfather, who was a partner in the business originally based at the mill. They completed the purchase and then restored the mill, which had been abandoned in the 1970s, with new milling equipment. Passed down through 7 generations, the lands of the family estate had always been bio-diverse, providing a mix of produce including almonds, grapes, and many old olive trees of the Lechín variety. While emphasizing that “my grandfather’s grandfather’s Lechín olive trees still produce olives,” Rafael breathed new life into the estate by planting young organically-grown olive trees. At a time when organic farming was quite rare, many neighbors may have considered the Alonsos to be out of their mind. Yet they believed using practices that respected the land would ultimately produce the best products in return. The family endured a tremendous amount of hard work to help the new trees succeed, but today count more than 26,000 olive trees on the estate. Rafael Alonso Barrau and Rafael Alonso Aguilera pose with relics from the family's old mill. My favorite time is the happiness of the 1st day of harvest, when the green olives arrive to the mill and the aroma in the facilities. That's the best moment of every year without any doubt. 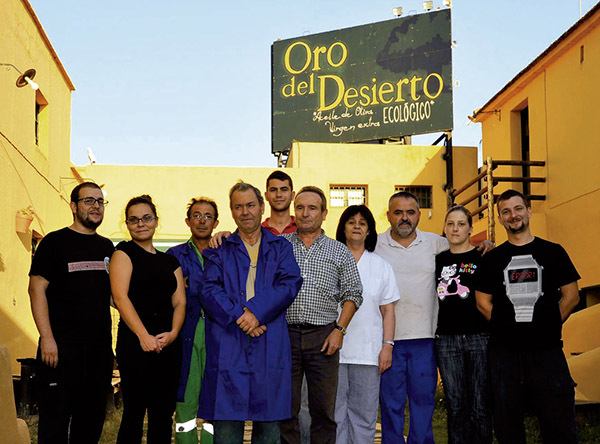 The Oro del Desierto team. Smell it... the fresh and nice aroma will say to you: Please taste me! At various times throughout the year, horses and sheep can be found in the groves, grazing on the weeds sprouting between the olive trees. This simple practice reflects how la familia Alonso views their place on the land: to continue the long-standing family traditions of environmentally-friendly farming methods without the use of synthetic fertilizers. In fact the landscape itself - perhaps another part of the family -also contributes to the organic practices, as the hot summers and cold winters naturally protect trees from pests and disease. The surrounding mountains also protect the groves from both the elements and from the potential intrusion of pesticides used by conventional farming practices - a true oasis In the desert. The oldest trees date back long before the original construction of the old mill. These trees, of the Lechín variety, have lived between 180-250 years. The Lechín trees’ age and the small, hard olives they produce require the fruit to be hand-picked. After inheriting the farm, Rafael reinvented the groves by planting thousands of new olive trees, mostly of the Picual & Arbequina variety, all young and organically grown. Picual is a favorite fruit to harvest, as its big olives can fall easily from branches with just a shake. Having so many young trees means the harvest yield will continue to grow, making this an exciting time for the Alonso family. Maintaining unity with the land, Oro Del Desierto implements many different sustainable farming practices. The compost that helps fertilize the farm consists of mill waste, sheep droppings, and other organic materials sourced from the property. Wild horses run free and eat the edible weeds growing beneath the trees. 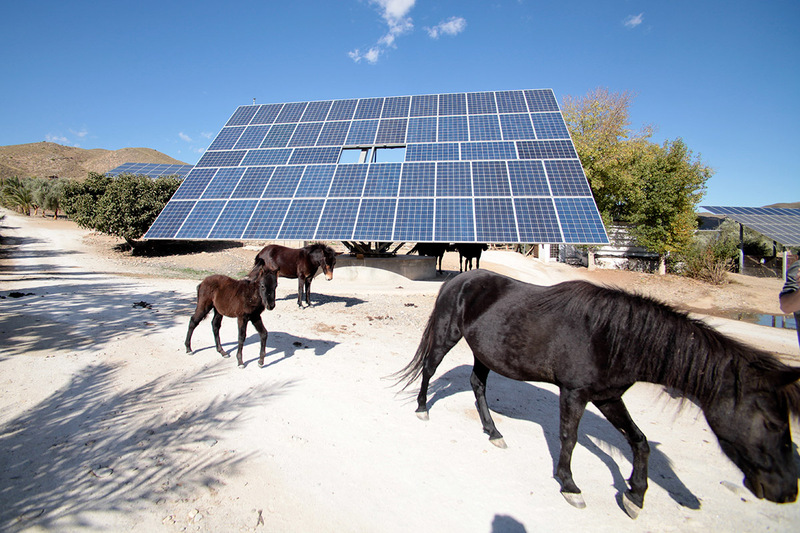 Solar outposts dot the landscape, and their power feeds not only the mill and restaurant, but also all the water pumps throughout the estate. The water used to irrigate the land traces to a reservoir in the mountains which collects water run-off naturally into a nearby ravine. Furthermore, their own patented drip irrigation system uses 30% less water than older systems. Even the work vehicles operate sustainably; the vehicles run on a biofuel created from filtered olive oil reused from the restaurant kitchen. 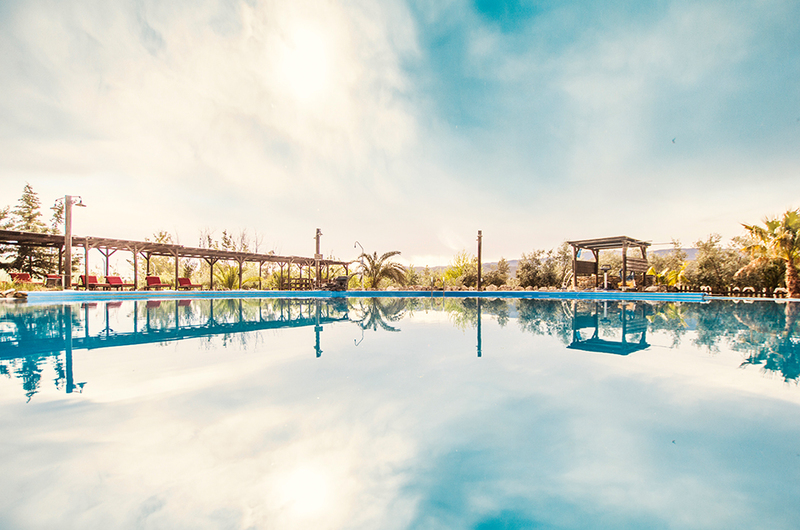 A charming estate wholly integrated into the environment, the Oro Del Desierto estate offers a number of options for the olive oil loving tourist. The property has several cottages for visitors and the restaurant, Las Albardinales, also includes an exhibition area housing relics from the old olive oil mill now restored to contain the restaurant space. In addition to olives, a variety of different foods grown or sourced from the farm serve as the source of the restaurant's main ingredients. Built in the 1960's, the cottages were restored in a manner that respects traditional Andalusian architecture. Their bioclimatic features make each rustic cottage suited to the climate, and like the rest of the farm, the guest amenities all operate using environmentally sustainable practices. To heat both the mill and restaurant, the proprietors burn olive stones left over from oil production. Solar panels installed on the cottage roofs provide the energy for hot water, and the cottages use a modern system of condensation to stay cool in the summer. The natural pool available to guests stays clean through natural biological cycles, and the recycled water irrigates the surrounding gardens. We think it’s a treasure to be in such an amazing landscape and produce a complex, fruity and fresh olive oil... something real that you can touch, taste and smell, something sturdy that you can offer to your customers to enjoy and that is good for them, for their health is the most satisfactory feeling for us. Through Las Albardinales, guests can book guided tours of the production plant and olive farm. The nearby A-92 highway provides easy access to the airport or Cabo de Gata beach, both within a 30 minute drive. 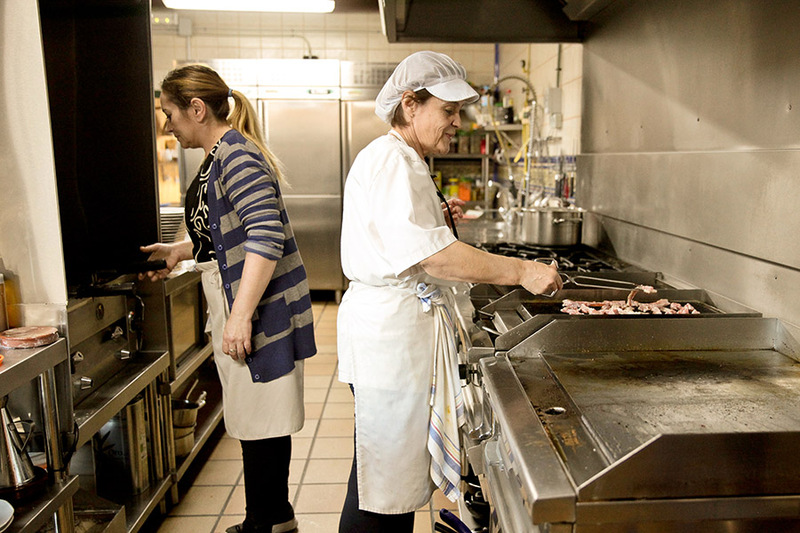 The matriarch of the Alonso family helps prepare a meal at Las Albardinales. Learn why we are the best at what we do and what makes us a brand consumers trust.